Caroline Wolfe is Teacher-Researcher in the Cedar Classroom of Opal Beginning School, which serves children ages three to five. 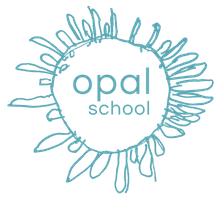 Caroline was part of a ten-member team that developed the proposal to start Opal School, a public charter school within Portland Public Schools and the Portland Children’s Museum, in September, 2001. Caroline has a degree in Psychology from University of Colorado at Boulder. Her teaching career began in 1991 and shortly after she learned of the world-renowned infant/toddler and pre-primary schools in Reggio Emilia, Italy. In 1996 and 2013, Caroline participated in week-long study tours of the Reggio schools. She strives to support children to ask questions and develop their own ideas and theories about the world around them through the arts. She believes wholeheartedly in young children’s capacities for connection, collaboration, and empathy. She believes that, through play, children imagine new possibilities for how to live in relationship with one another in our world, and that it is our responsibility to make their ideas known by sharing their stories.